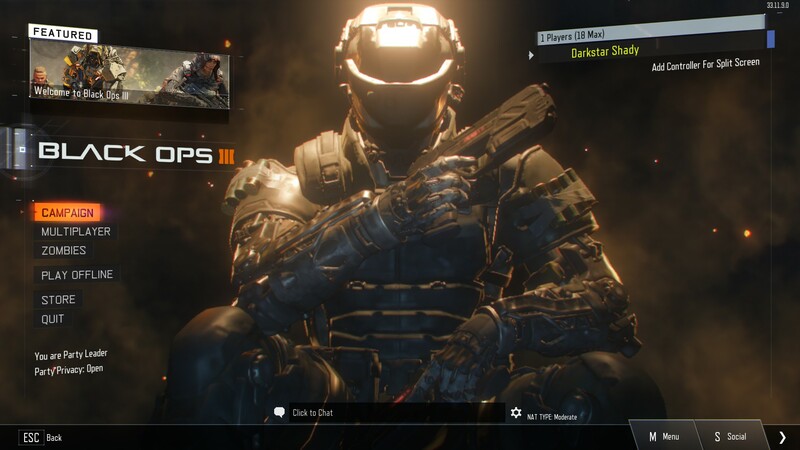 The main menu of Call of Duty: Black Ops III running on PC. Call of Duty: Black Ops III is the newest game in the hit franchise. While only three years have passed since the release of Black Ops II, 40 years have gone by in game. Like the last Treyarch-developed games, there are three main aspects to the game on the XBox One, PlayStation 4 and PC: campaign, multiplayer and zombies. Xbox 360 and PlayStation 3 users had to settle for the game minus its campaign mode. Without a current-gen console, I opted to preorder the PC version months ago, which gave me access to the futuristic remake of the popular Nuketown map. Having played minimal amounts of Call of Duty: Ghosts and skipping over Advanced Warfare altogether, the time jump between games and the new features involved seem all the more innovative. 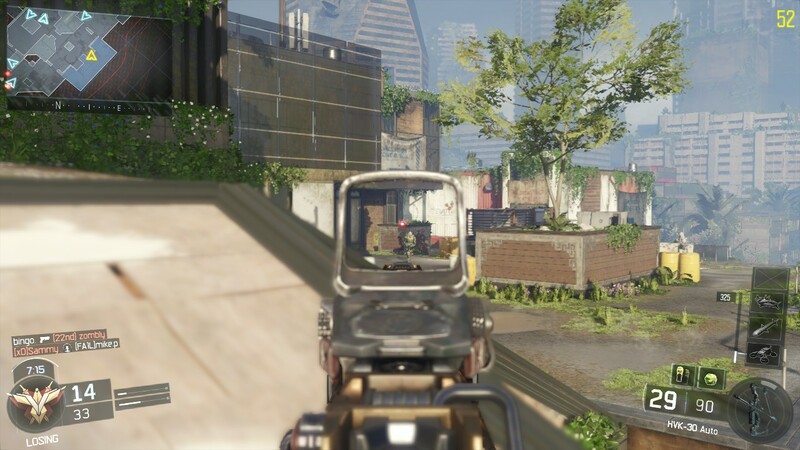 A screenshot of the first mission in campaign mode in Call of Duty: Black Ops III. The biggest thing of note is that campaign mode has been upgraded to be a multiplayer experience, however, I prefer to take the game at my own pace and I went into offline mode to experience the story while also learning about the new features of the series. The game starts off with one of, if not the most brutal stories of the series. The main character is in Egypt, trying to rescue hostages. One of the first things you do is hack into camera systems where you see people being tortured in various ways. After playing through the rescue, the team is being evacuated, only for one of the enemy robots to get ahold of the main character. You can only watch helplessly as your arms are torn from your body, but this is only the prequel to the main story. Afterwards, you learn that your life was saved with artificial limbs and something called a Direct Neural Interface. The DNI allows you to control yourself, as well as hack into enemy robotics. You’re then put through a series of simulations that show off all of the new game features, from your thrusters and the ability to run along walls, to the cybernetic enhancements such as hacking into enemy turrets. One of the highlights is that you’re shown there are multiple paths to get to each of your objectives. Rather than following a strict path from point A to point B, there are multiple routes you can take, which opens the maps up nicely. 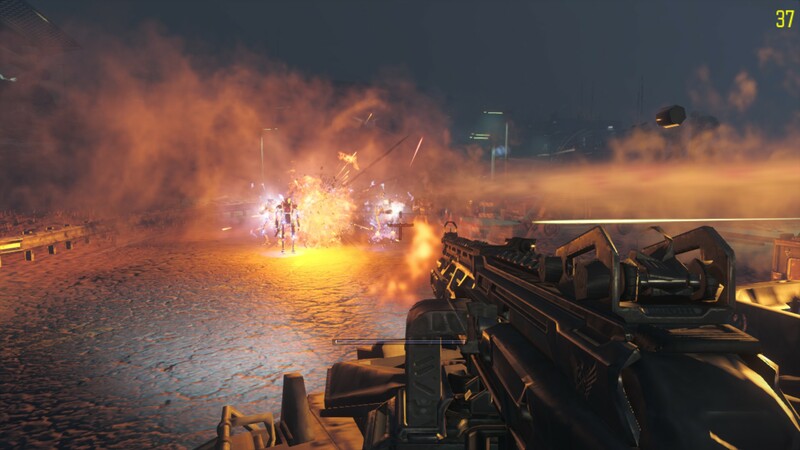 A screenshot from the start of the simulation missions in Call of Duty: Black Ops III. While playing through these, you get an idea for where the storyline will go, as the main character suffers flashbacks to being ripped apart, and is told that his meds can be adjusted to make that go away. You really get a feel that people are losing their humanity piece by piece, simply by thinking that technology is advancing and making things easier, when in reality they’re not learning to deal with what’s going on around them. The simulations end with the main character having to make a choice that leads to him being told that machines can do a great many things, but they can’t make the choices people can. The storyline itself is engaging, but the new features are implemented poorly. After the simulations and a montage of five years passing, you are put into a lobby, where you can walk around, go into more simulations (where you fight off waves of enemies), enhance your abilities or go into the missions. The biggest thing to note is that you lose all of your new abilities, and that you must earn points by completing missions to upgrade them. A better way to have introduced these is to gradually earn each ability throughout the main missions, and be taught the skills in real combat, rather than utilizing multiple simulations. The lobby itself is an awkward addition and would feel more natural as a set of menus. In addition to campaign, there is a mode called Free Run, in which you race through a series of obstacle courses using wall runs, thrusters, slides and weapons on a timer. If you’re just looking to familiarize yourself with the game mechanics before jumping into multiplayer mode, Free Run is the best tutorial you could ask for. After a cartoony, noir-style story intro, zombies mode allows you to do what it always has: run around a large map, buy weapons and upgrades with earned points and shoot zombies. There’s not a lot to innovate there; I’m not great at it, but it’s a fun way to pass the time whether by yourself or with a group of friends. A screenshot of a Team Deathmatch multiplayer game on the Evac map in Call of Duty: Black Ops III. The biggest draw for many gamers, myself included, is the multiplayer action. While not terribly different in basic mechanics from other Call of Duty games, some things should be noted. I was pleased to find matches in various game modes almost immediately throughout different hours of the day and night. There seems to be no shortage of PC players active on the game. The maps themselves are well crafted and balanced for the new game mechanics. There’s a variety of ways to get around, such as walls that run around the edges of the map that you can run along, water to swim in and elevated areas to access with thrusters. However, it takes a bit of getting used to. I found myself falling off edges I didn’t realize were present, swimming and ending up going off a waterfall,or not realizing certain areas were accessible until a wall-running enemy came face-to-face with me guns-ablaze. Despite the maps being designed well for gameplay, some are too saturated with bright, cartoony colors and look out of place aesthetically in a war game that isn’t found on Counter Strike’s custom servers. A side-by-side comparison of my computer specifications and current Call of Duty: Black Ops III graphics settings as optimized by NVIDIA GeForce Experience. While my graphics card may not be top-of-the-line, I have a fairly powerful computer. I stay at a near-constant 60 frames per second on my current settings. Parts of the game can run on higher settings than my NVIDIA GeForce Experience optimization, but my frame rate drops rapidly once I hit some of the bigger, more open parts of the campaign. Some players have had issues with i5 processors (but there was a patch released that should help), while others have had issues connecting to the servers, but I’ve encountered no real issues aside from a lack of skill compared to some opponents. If you want a smooth gaming experience but cannot meet the minimum hardware requirements (and then some to play on higher graphics settings), consoles are a cheaper way to go. The gameplay and mechanics as a whole are more reminiscent of Titanfall than they are previous games in the series (with the possible exception of Advanced Warfare). Though Black Ops III movements seem clunkier than Titanfall. Black Ops III makes wall running and using thrusters feel more forced than a natural ability. All in all, the game offers a compelling storyline and a multiplayer experience with well-structured maps suited to the new game mechanics. It’s a worthy successor in the trilogy of games. 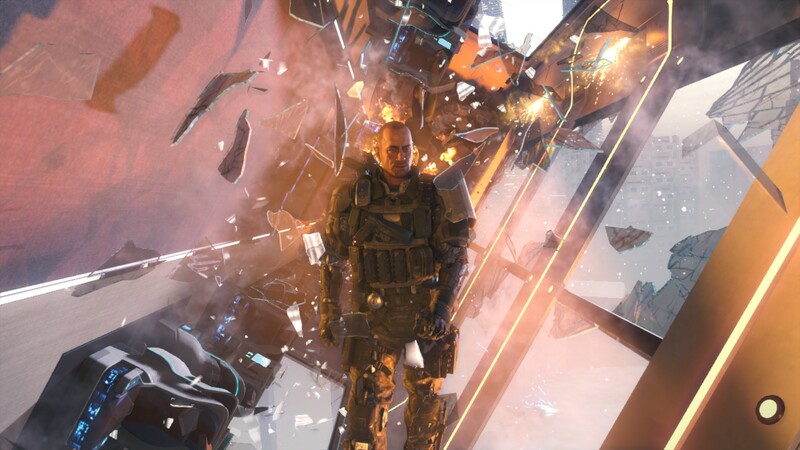 But still, I can only hope future Call of Duty installments move away from the futuristic setting and return to something between the Modern Warfare series and the first two Black Ops games. The sentence about choosing a console over PC to have a smooth gaming experience has been edited for clarity. Great read, very well written and thorough. Good stuff Stephan!